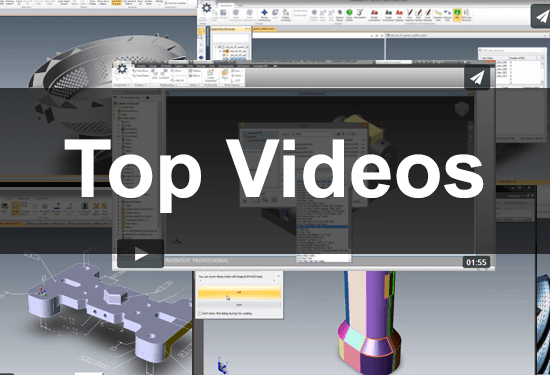 Our most popular video was SOLIDWORKS and Inventor File Conversion with over 10,000 views; this speaks to the large number of SOLIDWORKS or Inventor users out there. Many TransMagic users are not aware that if you own TransMagic PRO or EXPERT, you automatically have access to the SOLIDWORKS PowerPack and the Inventor PowerPack, which enable you to access all of the TransMagic supported formats from within your CAD application, even if you don’t have the latest version of your CAD software. In addition, you can access TransMagic repair tools, and if you wish, you can click on a file from inside your CAD application and open it in TransMagic standalone (1:55). The TransMagic CAD Repair Demo is a classic, illustrating that basic CAD repair functionality which has been a mainstay for CAD users for well over a decade (4:32). This video introduced new features at the time, such as 3D PDF write, assembly features, precise positioning, dynamic dimensioning, the View Browser and the PMI Browser. This video still receives more than its share of views, even in the era of TransMagic R12 (4:40). Multi-CAD is still a hot topic, as many users are forced to use geometry from different CAD systems in the design and manufacturing process. TransMagic reads all major CAD formats, writes several native formats, and of course supports read and write for geometric modeling kernel formats such as ACIS and Parasolid, as well as neutral formats like STEP, STEP 242 and IGES, broadening your potential customer base (1:24). Moving to model-based design saves you the hassle of working with 2D drawings and eliminates the danger of model and drawing getting out of sync. TransMagic allows you to view and translate not only the 3D model, but the notes, dimensions and GD&T information embedded in the Product Manufacturing Information (PMI) associated with that model (2:04). Thanks for checking out our top videos; what would YOU like to see in an upcoming video? Drop us a line at social@TransMagic.com and we’ll try to make it happen!